This page serves as an archive for the MOOC and also a quick startguide to the project. Please note that this is an emergent project with over 2,000 collaborators from 60+ countries. Over the last year more than 120 self-organized events have been staged around the world. What’s the goal of the MOOC? Over the course of 6 weeks you and your teammates will ideate, design and prototype a 21st Century adaption of Sherlock Holmes that embraces a set of core principles. A prototype could be a game, an immersive storytelling experience, an enchanted object powered by IoT, a Sherlock AI bot, an AR or VR project, a learning program for youth and/or an experience that makes social impact. The choice is up to you. How the MOOC is delivered? The MOOC is decentralized and delivered across a number of services and platforms. Each week we send out a MOOC email that includes lectures, challenges and Sherlock inspired content. It’s started can I still join? Over the course of the MOOC participants are welcome to join at anytime and deadlines are on a rolling basis and flexible. The first step is to take the “Which Sherlock Character Are You?” survey. After you take that we’ll add you to this pairing spreadsheet. Where do I find the weekly MOOC emails? How can I sign up for the MOOC weekly emails? Where can I meet and talk to my fellow MOOC participants? The Baker Street Irregulars is a backchannel for the MOOC. Meet collaborators, get answers to questions and share knowledge and resources. I’m just getting started but my partner for the 5x Why challenge isn’t responding? We recommend posting in the Baker Street Irregulars forum and asking other participants if they can help you complete the 5x Why challenge. You’re welcome to do it more than one time as it helps others onboard into the MOOC. I’m interested in running a Sherlock IoT event and/or workshop. How do you recommend I get started? A good way to get started or to introduce the project to others is by running the paper prototype. The prototype is fun and engaging and works well with 12 to 250 people. It’s simple to run and needs few materials to get you up and running. Just masking tape, post-its, butcher paper and some markers. If you do end up running the prototype please make sure to shoot some photos and tag them #SherlockIoT on Facebook, Instagram or Twitter. Also we’d love to hear how it went and if you remixed or modified the prototype. To find out more click here. 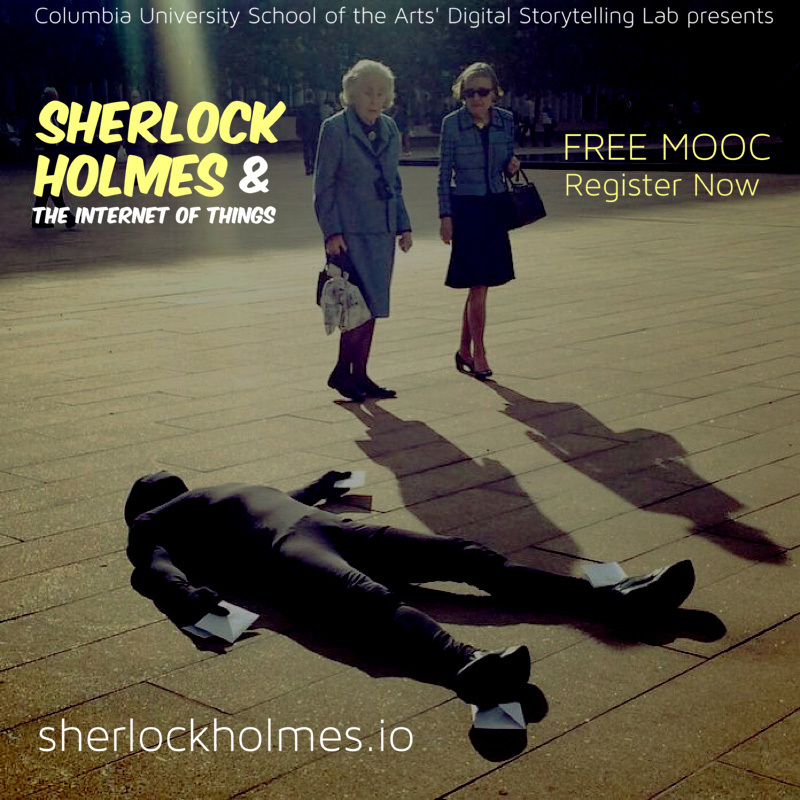 Sherlock Holmes & the Internet of Things is an ongoing prototype developed and run by the Columbia University Digital Storytelling Lab and Learn Do Share @Columbia that explores new forms and functions of storytelling. Designed to be an open R&D space (released under a creative commons license) that experiments with shifts in authorship and ownership of stories, the massive collaboration also uses a detective narrative to examine the policy and ethical issues surrounding the Internet of Things and emergent technologies. The goal of Sherlock Holmes & the Internet of Things is to encourage participants to step into a collaborative framework that enables them to create 21st Century adaptations of the work of Arthur Conan Doyle. These “forked” projects use Sherlock Holmes as a jumping off point. To date a number of spinoff projects and prototypes have been created. From escape the room games to team building frameworks to high school educational programs to card games to connected objects that tell stories to Virtual Reality and Augmented Reality games and applications – Sherlock Holmes & the Internet of Things has provided a foundation for open creativity. This summer and fall teams will create, design, build and test prototypes that continue to fork the project. Over the course of 6 weeks you and your teammates will ideate, design and prototype a 21st Century adaption of Sherlock Holmes that embraces a set of core principles. A prototype could be a game, an immersive storytelling experience, an enchanted object powered by IoT, a sherlock AI bot, a learning program for youth and/or an experience that makes social impact. The choice is up to you. We’re working hard to establish a non-judgmental space that embraces “Yes, And…” thinking. This applies not just to your design challenges and work product, but also in the way that you communicate and collaborate together in team and collaborative workspaces. We have a few collaborative guidelines that we’ve used over the course of the project that we’d like to share with you. Building upon the learnings from staging 70+ prototypes in over 20 countries it was determined that we’d explore collaborative practice, encourage movement of teams, and build upon the balance between team space and public space. Four core design principals emerged. Sherlock Holmes & the Internet of Things is a decentralized MOOC (massive online/offline collaboration). This means that we are utlizing a number of sites and services. Forensic Files via MAILCHIMP – The core of the MOOC will be delivered weekly via email. Over the 6 week course you’ll receive a new email each week with lectures, tasks and challenges. You can find an archive of all the emails here. Baker Street Irregulars via FACEBOOK – Need help? Looking to share insights? This closed Facebook group is the backchannel for the MOOC. Our goal is to establish a peer based learning & doing space. In order to do so we ask that you help your fellow sleuths. Click here to checkout the group. Watson’s Notebook via MEDIUM – As teams work they’ll be documenting their journey throughout the MOOC. Each team will create a Medium publication where they will record and share their progress. Starting August 30th click here to see Nick & Lance’s Medium publication – an inside look at the prototyping process leading up to the Sherlock event at Lincoln Center in early October. Scotland Yard – When we reach week three we’ll open a special ideation/prototyping space. More details coming soon. 221 Baker Street – Everything in the MOOC will be archived at SherlockHolmes.io The archive will launch on August 23rd. The Strand Magazine – MOOC media will be available via Voice Thread & Soundcloud. You’ll be able to find the links you need in the weekly emails. In addition we’ve been working hard to expand the Sherlock Holmes & the Internet of Things MOOC. – We’ve launched a newly designed Sherlock Holmes & the Internet of Things information site. – There will be more of a focus on the work of Arthur Conan Doyle through a series of guest lectures and readings. – We’re also partnering with a tech start-up to produce a special Sherlock IoT Kit that will be available specifically to those who take the MOOC. – No need to apply instead we just ask that you register so that we can reserve a spot for you. – Work from the MOOC will be presented at Lincoln Center during the New York Film Festival later this fall. – In the coming months we’ll be announcing some new exciting partnerships that will ehance and expand the opportunities of the MOOC. Last year over 1,200 collaborators from more than 60 countries took part in Sherlock Holmes & the Internet of Things. Over the last year 100 self-organized Sherlock Holmes & the Internet of Things events have be staged around the world. For example in the next two months Sherlock events will unfold in Paris, Warsaw, Rome, Tornio, Sao Paulo, Sydney, NYC, LA and Washington D.C.
Sherlock Holmes & the Internet of Things is a global storytelling experiment. A prototype of the Columbia University School of the Arts’ Digital Storytelling Lab, the project explores new forms and functions of storytelling. Within the project is an interesting set of frameworks and methods that are focused on collaborative practice that directly address the challenges and opportunities of working with distributed creative teams. 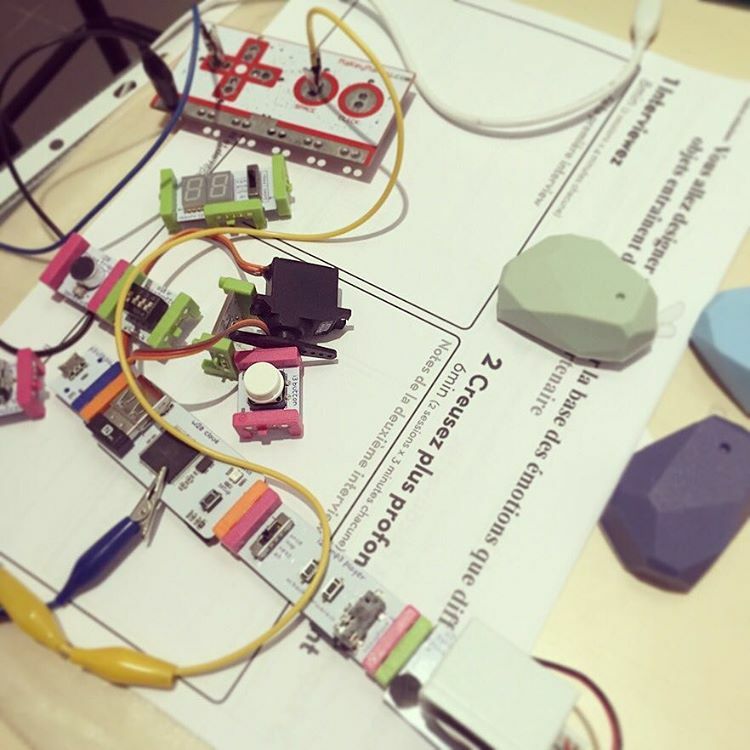 The Sherlock Holmes & the Internet of Things prototype is highly collaborative and can be staged with a few core participants 12 to 50 within a masterclass setting or is perfect within an event, conference or festival setting for a group of a few hundred. The largest group to date that we’ve run things for is about 500 participants during Power to the Pixel in 2015. The goal of this open creativity project is to inspire a series of 21st Century adaptions of Sherlock Holmes that embrace the notion that storytelling can be an innovation and R&D tool. The project has forked in some amazing ways leading to games, educational programs, VR, AR, and IoT experimentation and later this fall machine learning via IBM’s Watson will be woven into the project. Are you a festival or conference that’s interested in running a Sherlock Holmes & the Internet of Things event? Are you a Sherlock IoT collaborator that has an opportunity to represent Sherlock Holmes & the Internet of Things at a festival or an event? Would you like Nick or Lance to speak at your event about Sherlock Holmes & the Internet of Things?